The Long Utopia by Terry Pratchett and Stephen Baxter is my favorite book of this series, since the first one. The first book in the Long Earth series captured my imagination to a degree that’s rare. The world of the Long Earth is stunning. The characters Mr. Pratchett and Mr. Baxter created are fascinating individuals and it’s a rewarding experience to spend time with them. When I read a book, I want to feel like the story exists for its own sake. I want to feel like the authors are compelled to tell this story, and no other. But the stories in The Long War and The Long Mars feel like they exist mostly as excuses to explore the expanding world of the Long Earth. This isn’t to say that the stories haven’t been good—they’re well-structured and well-told, populated by characters who I care about—but I can’t shake the feeling that different stories would have served the purpose just as well. Exploring the world takes precedence over telling the best possible story. I enjoyed The Long Mars, the third book in Terry Pratchett and Stephen Baxter’s Long Earth series, better than the second entry. This outing managed to recapture some measure of the sense of wonder that characterized the first book in the series. Opening up the Long Mars adds a welcome layer of new complexity to the milieu. Sally, her father, and Frank Wood travel to and explore the Long Mars. Captain Maggie Kauffman and her crew take another epic journey into the Long Earth—this time, traveling to Earth West 250,000,000. Joshua and Lobsang search the Long Earth for what Lobsang believes are a newly emergent and highly developed strain of homo sapiens. Nelson Azikiwe and Roberta Golding make appearances in this plot line. The Long War, the second book in The Long Earth series by Terry Pratchett and Stephen Baxter, gets a lot of things right. It corrects some of the structural missteps that the first book suffered. And yet, I don’t enjoy this one as much as its predecessor. Which is not to say that The Long War isn’t a good science fiction novel. It is, and I enjoyed the few hours it took me to read it. I don’t think it’s possible for two such talented authors to write something that isn’t good. The narrative structure is smoother than the first book in the series—the transitions between the various story threads are less haphazard. The tone of the writing is clearer—there are no discordant notes between the seriousness and the humor this time around. 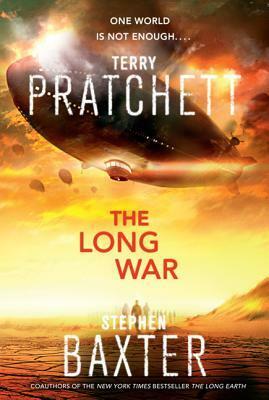 I wasn’t sure what to expect from The Long Earth by Terry Pratchett and Stephen Baxter. These two authors seem like an odd pairing. Sir Pratchett is one of the greats of humorous fantasy but certainly isn’t known for hard science fiction. Mr. Baxter is a leading light in hard science fiction and alternate history but he’s certainly not known for his comedic chops. I’m happy to report that I enjoyed their first collaboration very much. This is a fine science fiction novel. The Long Earth is a rather literal take on the multiverse theory—one day, people all over the world learn how to “step” into alternate Earths. There are uncounted millions—possibly an infinity—of these alternate Earths, and humanity eagerly spreads out into them. Most people require a device to step across to these other worlds, but some can step naturally, and some can’t cross the boundaries at all. The Magician’s Land by Lev Grossman is the perfect ending to his Magicians trilogy. I would say that it’s not the ending I expected, but I honestly had no idea what to expect. It’s not a typical happy ending, but that’s a good thing—a happy ending would betray the entire concept of the trilogy. So the ending isn’t fairy tale happy, but it’s very satisfying. It leaves the reader and the characters satiated, without any pandering or overly cheery false notes. In retrospect, it takes on an appearance of inevitability. Having read it, it now feels like the only ending possible. It rings true. The Magician’s Land is both grand in scope and strangely mundane. But that mundanity is also what makes it profound. For a variety of reasons, for the past few days I’ve been thinking even more than I usually do about the differences between print books and digital books, and how our brain processes them. There are differences in how we read in different media, and it’s important for us to understand them. If our brain interacts with different formats differently, it means that different formats will best serve different purposes. It’s our job as librarians to fulfill our patrons’ information needs as best we can. Selecting the best format for the information is increasingly important. This is my latest attempt to summarize my understanding of how and why print and digital differ.